Herbal teas in your kitchen. Disclosures, sharing, work with me! This post is my attempt to put into words what I could not find online. You see, I had seen a picture online (Facebook I think) of cinnamon rolls made using a waffle maker. I decided that these would be perfect for oldest daughters 19th birthday breakfast. I searched and searched but every single post I found was just a picture. Some had blurbs like "make cinnamon rolls in your waffle maker in 2 minutes!" but other then that...nothing. So I decided that if I can't find what I want online....I should write it myself! 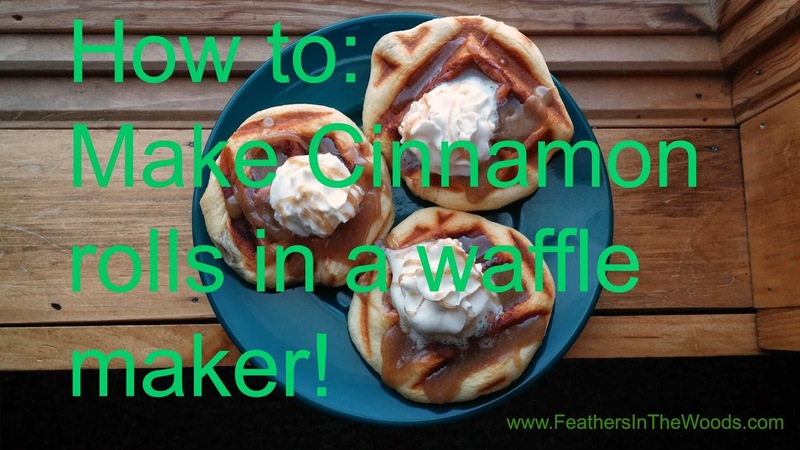 So here we go: How to make sweet rolls in your waffle maker! I used Pillsbury caramel rolls since those are some of Caity's favorite. I preheated the waffle iron just like when I make waffles. My waffle iron has a 'preferred' setting. It's 1/2 way between medium and high. I found that this setting worked best. 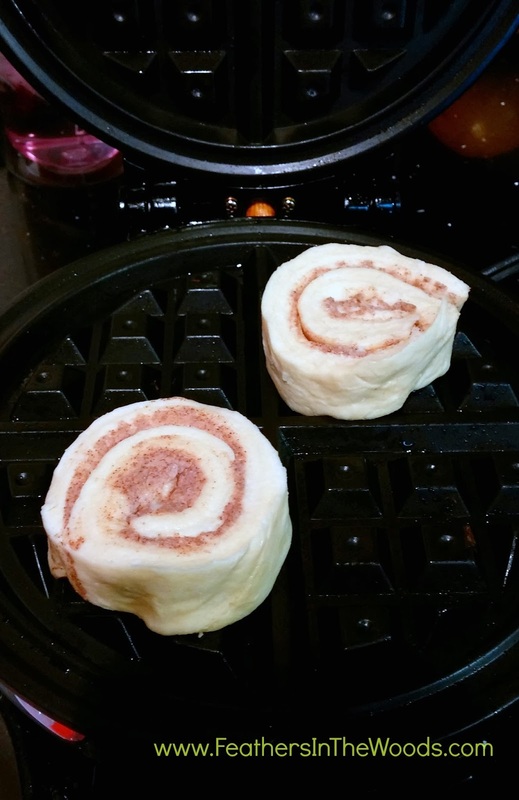 Once the waffle iron is preheated put rolls in separate corners allowing room for expansion. If you put 4 in and they're too close together the middle sort of runs together and they don't cook all the way through. It's best to leave space and only do 2 at a time. I closed the lid gently (don't press) and let them cook. 4 minutes turned out to be perfect! Remove from waffle iron. If you place the next 2 rolls in the corners you didn't use the first time, you wont have to let the iron heat back up. Just stick the next 2 in and let cook! I warmed up the caramel topping in the microwave for about 15 seconds. Spoon over waffle rolls. The waffle pattern has little squares for the icing so it doesn't run off! I also added a dollop of whipped cream to pretty it up since it was Caity's b-day! 1)You don't have to heat the oven up...cost effective. 2) You don't have to heat the oven up....keeps the kitchen cooler in summer. 3) Much quicker then the oven method. 4) If you loose track of time during cooking the whole batch of 10 isn't ruined, only the 2 currently cooking get trashed! 5) You can stagger cooking times so the kids can eat before school, hubby can eat before work etc etc...everybody gets a hot breakfast! There you have it....actual directions! I know...I complained about this before. Pins and links that are just pictures are my pet peeve. LOL I do not expect everyone to share my views, I just express them as they come up. However, it has given me a slew of new topics to write about! If you happen to see something that you want to make/do and just can't find actual instructions then please, email me at FeathersInTheWoods@gmail.com I will gladly make my kitchen or craft room your guinea pig and experiment to find an answer for you! I love a good challenge! That drives me nuts on pinterest when I find something I love and it just a picture! GRRRR... I make these cinnamon rolls all of the time. I can make myself one or two without heating up the stove. Plus I love how the waffle nooks hold in the frosting! Exactly! The icing doesn't roll off, it just sits on top...awesome! It is a great idea! I make French Toast in the waffle iron too! It is a different texture than the kind made in the skillet...the advantage is that you don't have to use a bunch of butter while browning it. It's sort of a French-Toast Waffle! :) Or Waffle French Toast. Ohhh, good idea! Ill have to try french toast waffles now! Thanks! Copyright 2011-2019 Feathers In The Woods. All rights reserved.. Powered by Blogger.